Organizations today are “doing more with less” by constantly finding ways to reduce expenses while increasing productivity. One area of business that is often overlooked is your print environment. 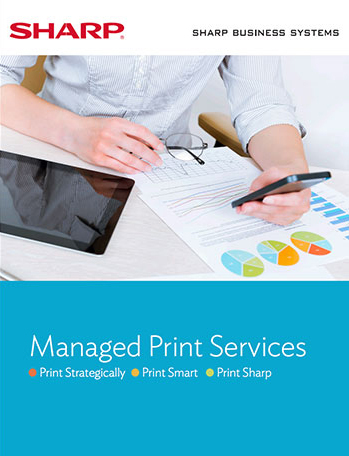 Many companies are astonished with the inefficiencies and excessive expenses uncovered by our Managed Print Services (MPS) Analysis. At Sharp, we offer a consultative approach to MPS. We identify your current printing costs and practices through an in-depth assessment and then implement a customized plan that won’t burden you with additional overhead while freeing up your resources to focus on core business initiatives. Our MPS Analysts undertake a step-by-step process to meet your unique objectives. One of the first steps is to establish a benchmark of your print environment which is used to measure all future MPS Program enhancements. We also uncover the total cost of ownership (TCO) of your existing fleet. This includes your current cost of supplies, service, parts, outsourced print jobs, carrying costs of under/over utilized devices and man-hours spent on device management. We then recommend various MPS Solutions which can ultimately help reduce your TCO. Most importantly, we continue to review your progress against the benchmark on a regular basis, and scale the program to fit your growing or declining business requirements accordingly. We assist with the creation of an ideal fleet where all devices are networked, monitored, right-sized and properly placed in order to improve productivity, operational efficiencies and ultimately reduce the overall cost of ownership. Our in-depth assessment allows us to properly evaluate the true cost related to fleet migration and the resources that will be required before, during, and after implementation of a managed print services solution. We provide you with a “single pane of glass” view of all activities, costs, and actions within your print environment. Our integrated cloud-based application suite has robust reporting tools to help manage assets, capture data, and enable the best actions to be taken based on accurate data for real-time fleet management and ongoing fleet analysis. Rules-based printing allows your business to better manage its print environment by ensuring all print jobs are routed to the most appropriate, cost-effective device for operational efficiency as well as waste reduction. All print jobs are analyzed and routed based on a set of predetermined rules and conditions. Users receive notifications anytime a less efficient machine is chosen or a document is unnecessarily printed in color. Enhanced monitoring allows for print costs to be charged back to individual departments to promote good printing behavior and support waste reduction and green initiatives. Dynamic print routing enhances mobility by allowing employees to print securely and to virtually any networked printer directly from their mobile device. Print jobs are released when you are ready to pick them up from a networked MFP following user authentication. This reduces duplication or forgotten documents as well as ensuring sensitive documents are not viewed by others, thus helping to reduce waste and maintain compliance with stringent industry regulations. Imagine having a single point of contact for your entire print fleet. Wouldn’t it be great to eliminate the frustration of juggling multiple contracts, supply invoices and service orders? Our MPS Program can help turn this vision into a reality with a single, predictable monthly invoice from Sharp to simplify billing and administration. Our cost-per-copy (CPC) plan helps to dramatically reduce printing related costs by only paying for what actually prints. If you decide to replace older devices with newer equipment, the cost of hardware can be incorporated into the CPC rate, with no additional capital expenditure required. Significant hard and soft dollars savings can be realized in the form of both time and money spent managing a fleet. Converting to a CPC plan from a single vendor can reduce the bottom-line cost to print, but additional savings will be realized by limiting requisitions, PO creation, receivables, and time spent by Accounts Payables on invoices, reconciliation, and managing multiple vendors. Moreover, outsourcing fleet management leads to standardization of devices which limits the time and cost of training. Our monitoring and management processes make sure you have the parts and supplies you need exactly when you need them to avoid downtime. Gone are the days when stock of parts and supplies are allowed to accumulate, not only taking up valuable space but also representing nonperforming capital. A truly effective MPS program provides more than automated supplies and service fulfillment. Our adaptable outsourcing solution leverages extensive experience in applying Best Practices and Standards to the corporate IT infrastructure, and applies managed services to the print environment. Reduce your non-standard systems costs by utilizing any or all of our integrated software platform, in-house helpdesk, tech support, nationwide service network, strategic vendor relationships and Just-in-Time delivery efficiencies. Re-direct IT efforts from reactive “printer support” personnel to strategic technology enablers that can focus on initiatives that are mission critical and core to your business.